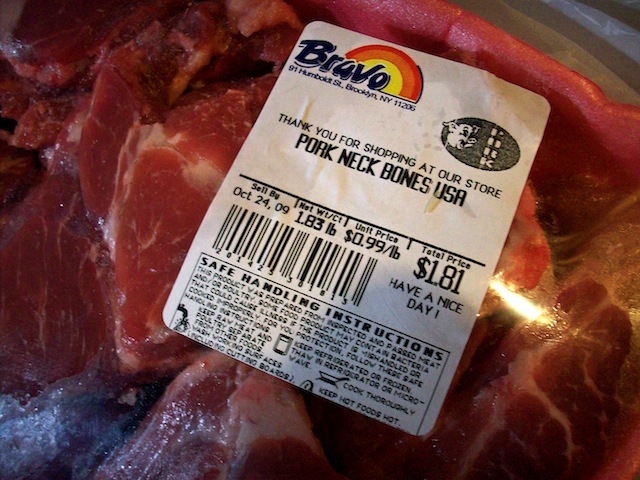 If Your Grocer Doesn’t Sell Pork Neck Bones, You’re Probably Not Poor Enough: Poor Richard’s Pork Neck Bones – Eat Me. Drink Me. This was the opening line to an email my uncle sent a few years ago after his move to West Virginia, the second poorest state in the country after Mississippi. At the time, I laughed. I’d never seen pork neck bones in any grocery store I’d ever been to. I didn’t even know you could eat pork neck bones. Then I moved to New York. And not only am I poor, but everyone around me is poor too (unemployed artists and musicians to the left, the projects to the right). So on my first visit to Bravo, my local grocery store, I was intrigued to find that the bizarre cuts of meat outweighed the “normal” selection. Pig tails and feet, turkey necks, chicken gizzards, pork belly, goat meat, beef honeycomb tripe, cow feet, oxtails, beef liver, and pork neck. Remembering that long forgotten email and being of a curious bent, I decided to make pork neck my first foray into adventurous cooking. I wish I could tell you it was a more bizarre experience than it was. But pork neck is, well, decidedly normal after you’ve cooked it for two hours. The meat is incredibly tender and rich after having soaked in notes of brown sugar, cayenne, and salty broth. I made a regular Southern meal out of it with fried okra and cornmeal griddle cakes, and with pork neck stew spooned on a hot griddle cake—I felt much wealthier than I was. All this has gotten me thinking about food stigmas, what it means to eat “poor,” and how food often undergoes the same sort of gentrification a neighborhood might. Take grits, for example. Grits are unpretentious. They are plentiful, inexpensive, and staple-worthy. Yet you can go to a five-star restaurant and order grits for $40 or $50. Those better be some damn good grits. You could argue that grits might not be the best example to use, since grits are beloved in the South by various socioeconomic groups. This is true. So on the one hand, there’s the process of taking an inexpensive, widely-available food, elevating its humble status by putting a big price tag on it, and selling it as a commodity. The other type of food gentrification involves “discovering” an out of vogue food item, putting a big price tag on it, and selling it as a commodity (why am I thinking of Columbus?). I remember reading an article a few years ago about pork belly (one of the meat products my Bravo sells), which talked about how this overlooked cut was a hoggy jewel. Now, when you Google pork belly, you get recipes for things like “Pork Belly with Caviar,” whose lead-in reads, “What could be better tha[n] deliciously fatty pork belly and salty, elegant caviar?” What, indeed. We may think we choose the foods we eat based on taste or desire, but the motivation behind our dining selections is often socioeconomically imposed. If my grocery store, which sells organic chicken breasts, doesn’t sell pork neck, I won’t choose to eat pork neck, and if my grocery store doesn’t sell organic chicken breasts, well, that eliminates a choice as well. So what makes food “poor” or “passé”? Clearly, it’s not taste, as evidenced by my pork neck stew. Maybe it’s bone or bits, appearance, texture. Or maybe it’s just price. 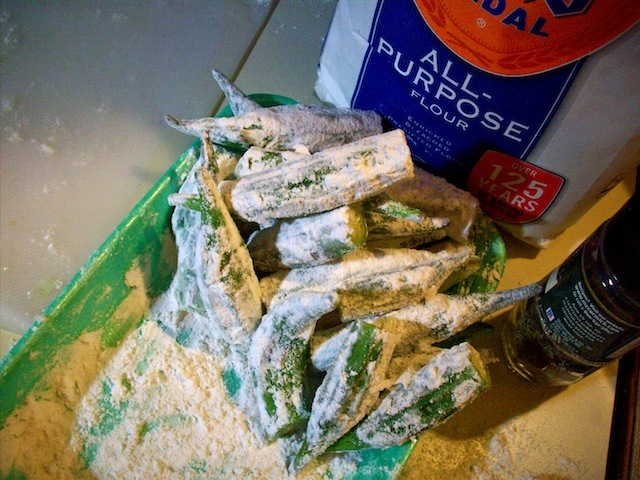 Following is the only slightly modified recipe from my uncle’s original email. Wash pork neck bones under running water and brown them in olive oil over medium-high heat, turning frequently. 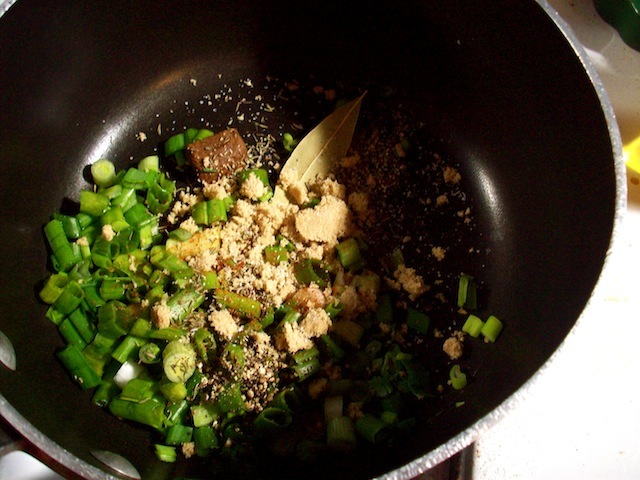 When browned, add green onions, bouillon cube, thyme, salt, pepper, red curry, brown sugar, bay leaves, and water. Cover with a lid and simmer for 2 hours. Stir occasionally and add water as necessary. When meat is tender, remove from bone. Honored to have been mentioned in your blog. Glad you found the recipe useful. As for the heading, I can’t take credit for the words. That’s how I learned the recipe, “if your grocer doesn’t sell pork neck bones . .”, and this seems to be the standard method of passing it along. Adding the dash of red curry (your version : red pepper), improved upon the original recipe, and if you have a few cloves to grind or a pinch of allspice, it doesn’t hurt the flavor. Great essay. Insightful. The start of the revolution. Cheap cuts of bony and marrowy meat (beef shanks I love you! )are the truest luxuries when long-braised. Perfect for fall and comfort and Bravo/a to you; this meal sounds delicious!